Allie comes from a family of winners. Her younger sister is already a TV star, her brother is a star soccer player and her grandfather has won a Congressional Medal of Honor. Allie knows she needs to do something to add her name to the list of Velasco achievers. 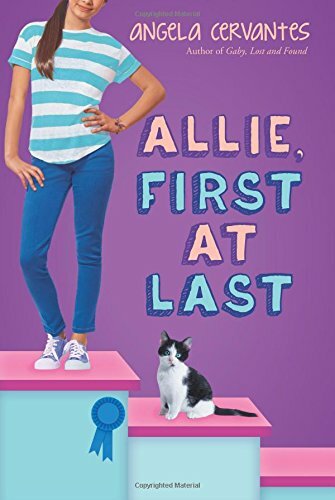 When her teacher announces a contest, Allie is determined to be the winner and decides to document her great-grandfather's life. But the path to winning her award is not smooth as she has to deal with her ex-best friend and new boy Victor who is full of surprises. I really like Cervantes' voice for middle schoolers. Both books I've read by her (Gaby Lost and Found) are authentic and don't sound like an adult trying to write like a girl in middle school. Victor is a great character and provides a good lesson for Allie about making assumptions. Lessons are learned, to be sure, but the story lets the reader figure things out without telling you what to think.